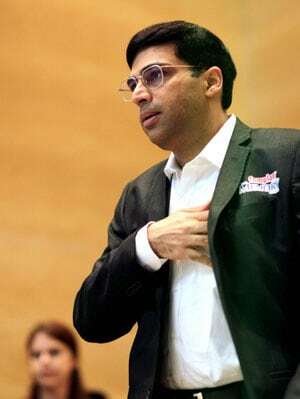 Viswanathan Anand said delay in addressing his errors cost him the World title to Magnus Carlsen, and it was his decision to stay away from chess, which helped him to recover emotionally and bounce back with a bang. The World Championship loss in Chennai had "knocked the stuffing out" of Viswanathan Anand but the five-time winner on Wednesday said that clinching the Candidates title has boosted his confidence and he would try to avenge his loss to Magnus Carlsen later this year. Three losses over 10 games without a win and the world Championship title was in tatters last November but Anand soon scripted a historic turnaround when he registered three victories in 14 games without a defeat en route to his Candidates victory to earn a rematch against Carlsen. The 44-year-old Indian said delay in addressing his errors cost him the World title and it was his decision to stay away from chess, which helped him to recover emotionally and bounce back with a bang. "I think many errors had cropped up in my approach to play chess. I was becoming reliant on computers and there were some mistakes coming up. I was not oblivious to it but I was not able to address the problem exactly right. I didn't have time to fix anything," Anand, who was to highlight the role of chess in Business Analytics in an NIIT event, said. "I remembered long back once after the end of an event, me and (Anatoly) Karpov were talking. He mentioned that a player who had a bad tournament will take long time to recover from bad result because he was so much in love with the game and he didn't have something else to take his mind off chess. "So I decided that it was more important to recover emotionally, after all, a result like this knocks the stuffing out of you. So in December and January, I was trying to avoid chess. There were some tournaments which were unavoidable but most of the time I tried to get away from chess," he said. Anand said: "May be my opponents didn't focus on me properly or probably I was playing more freely. I had one of my best results in Candidates and I'm playing in World Championship in November. "I got my confidence back and I am very optimistic now. I know even if I face the same mistakes, I will act now differently," added Anand, who held the World title from 2007 to 2013. Anand said he carried a lot of his World championship preparations to the Candidates tournament. "I was also lucky in a way that since my approach to the match backfired, I didn't get to use lot of my preparations and they were still there which I could carry over to the Candidates," he said. "I had a short training camp in February. I thought it was enough and it was more important to spend time at home, play with my son and wait for the hunger to come back and when I went to Khanty (Mansiysk), the first game went brilliantly, it was my first win over (Levon) Aronian and it gave a big boost to me," added Anand, a Padma Vibhushan awardee. Anand says he has a fair idea where he wants to work on before he takes on Carlsen later this year. "I have a fair bit of idea what I want to change and what I think went wrong. So I have an idea what I want to do. So I will choose my team accordingly. But right now, I don't want to give any details," Anand said. "Secondly, I'm waiting for the bill. The billing procedure will finish by the end of this month. So after that we will have an idea of the venue. It is roughly scheduled for November but I just want it to be confirmed," he added. Asked about his upcoming tournaments, Anand said he will play a lot of rapid events this year. "At the moment I am scheduled to play in Corsica in May. It is an exhibition event, then there is World Rapid and Blitz Championships (June 15-21) in Dubai and then I have an event in Geneva. I might put in another tournament but it depends on my trainings schedule. It is all very tentative," he said. "It is nice to play rapid chess again. Last year, I didn't get to play any rapid event, so it is good. This year, I will compensate for last year," he added. Asked if it would be a revenge match, Anand said: "Ya, well I will try to take the confidence to the World championship. It is inevitable that we will remember some aspects of that match but I will try to take it as a fresh match. "The previous results will obviously have some influence on my thoughts but it will be a different match. I will try to change the course and he is going to anticipate. I will think about what happened and try to give it a different twist this time," he said.